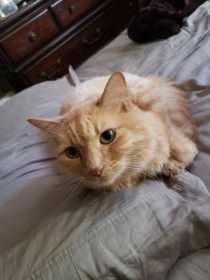 Aslan is a two year old long haired red/orange tabby cat with green eyes and a hint of blue. He is friendly but very cautious. He is also extremely afraid of the outdoors and other animals, If you have seen him or any information on a tabby cat please do not hesitate to reach out to me!